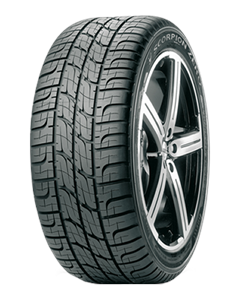 The new tread design assures maximum performance in every season and driving condition, providing both excellent grip and traction. Curved sipes in the internal blocks allow a better traction on snow, leading to increased safety and control on snow. High sipe density: over 30m of sipes (93% more than the Scorpion Zero Asimmetrico) provide excellent grip and traction in winter season, resulting in a great performance in the presence of snow. Optimized tread design with curved grooves and bridges leads to noticeable noise reduction for improved driving comfort. Four longitudinal grooves for an excellent water expulsion and the external one being smaller to provide pattern adaptability for increased safety on dry surfaces. Lower tread depth to increase dry braking performance without compromising wear performance.